Vermonters are writing like nobody's business. Every week, we at Seven Days receive at least one advance review copy or emailed request to review a local book — usually a self-published or micro-published one. Often we get more. We can't review all those books in the paper. Not even all the good ones. Not even close. But sometimes, if a book has potential, I dive in and read the first 50 pages. From those first 50 pages, you can learn a lot. This new twice-monthly blog feature is a way to report on what I find. Because it's interesting to see what your neighbors are writing. And because sometimes a book that I don't choose to review may still be one you'd like to read. 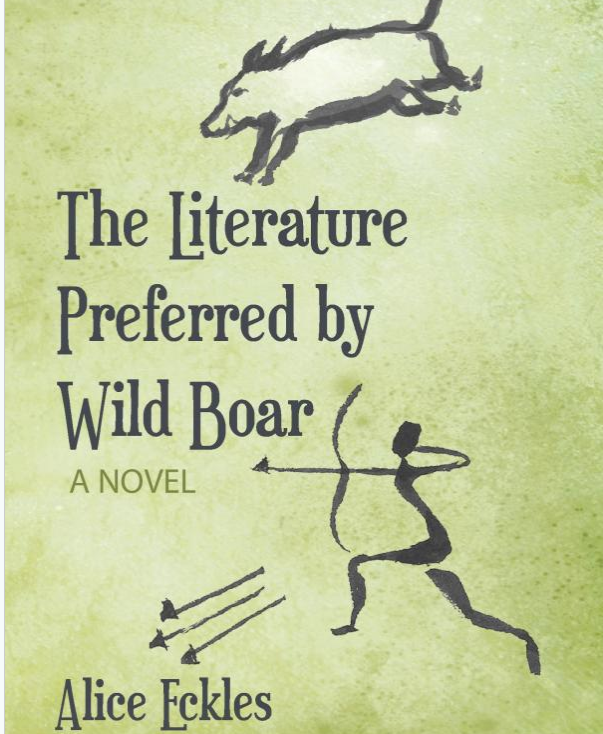 Our inaugural volume: a novel called The Literature Preferred by Wild Boar. Alice Eckles, a beekeeper and homesteader who lives in a yurt in Middlebury. Her first self-published book, A Phrase Book for Spiritual Emergencies, bears a glowing blurb from Jonathan Lethem, according to this page for the Indiegogo campaign she used to fund the production of Boar. "It was the year 2045, and the world was peopled by only three thousand six hundred souls." Two of those souls are middle-aged Deb and her husband, Charles, who live in Vermont in the ruins of an airplane hangar, keeping bees and taking their time about building a house. While Charles likes to keep busy toward the end of the world, former travel writer and current New Age mystic Deb is more interested in "wrangling a story … that would aid all humanity in old age, and bring peace and prosperity on earth." This task involves delving into her own past and reflecting on a pre-collapse incidence of "Crisis Averted," in which her grandfather came close to committing suicide. Meanwhile … what happened to the earth, anyway? Clearly climate change was involved, but Eckles describes a more poetic geographical rearrangement called the Great Wobble: "like an intelligent being inside Earth was moving chunks like puzzle pieces: a sort of sleeping giant at work, dreaming a new world." Oh, and magic carpets "infused with universal life energy" have replaced cars for the survivors' transportation needs. Sometimes they arrange "carpet-pools" — an instance of Eckles' dry and sly humor. "As soon as Charles suggested the outing, Deb heard a sound in her ears that reminded her of a bell, a soft tone coming in like a radio wave." "Cats can see an enemy in a speck of dust." People began to notice a sort of ten-year flextime. There was a dreamy subjectivity to time, and the reality of a person's age could be anywhere in the ten-year range. In other words, you would have to be dead for a full ten years before any chance of your also existing as alive was out of the question. "Deb belonged to the land, to nature, to the Great Spirit." No. Frankly, this book is just too mystical for this somewhat left-brained reviewer, and (in these pages, anyway) too introspective. I need more in the way of plot movement. That said, I wouldn't have read these pages if I hadn't admired Eckles' style. She writes with elegance and confidence, and none of the grandiosity I tend to expect from someone telling a story in a New Age vein. I did — to my mom, a self-styled anarcho-primitivist who loves the wilder works of Ursula Le Guin. She pronounced the blurb "yummy," bought a copy and emailed me her own favorite quote. Here's a real review of the book. Geek Mountain State holds a reading of "Vermont Tales of Science-Horror" this Saturday, April 25, 2 p.m., at Fletcher Free Library in Burlington. More info here. Have you ever tried writing a "found poem," collaging together text from other sources? James Moore of Winooski has written 24 just this month — to very exacting prompts — as part of a National Poetry Month project called PoMoSco (poetry month scouts) organized by the Found Poetry Review. He's been earning virtual "badges" with names such as Dialed In and Click Trick by building poems out of text selected by tactics such as rolling dice, taking a cue from a random encounter on the street or transforming a phone number. You can check out Moore's found poems here. Other local PoMoScos are Susan Bourne of Saxtons River, Yvette Frock Gottshall of Jeffersonville and Rebecca Siegel of Thetford Center. Thanks for calling this to our attention, James! A note to authors: I choose books for this column at my own discretion. Please don't send me your book with a specific request that I feature it here (or not do so). Please don't ask for an explanation either way. And please recognize that these write-ups are not "reviews," which would entail reading the entire book.